A few weeks ago, Jerry Seinfeld and Jason Alexander were spotted filming at the old Seinfeld hangout, Tom's Restaurant, but no one could figure out why. Now we know — it was part of some sort of "one-and-done" Seinfeld reunion. Seinfeld appeared on WFAN's "Boomer & Carton" show this morning presumably to talk about sports, but the conversation quickly turned to the photos of Seinfeld and Alexander. Other Seinfeld characters are involved. It's "short-ish" form, but longer than 60 seconds. Larry David is involved but not on camera in any form (guess no one needs a marine biologist?). It was shot at multiple locations. It will air "very, very soon." 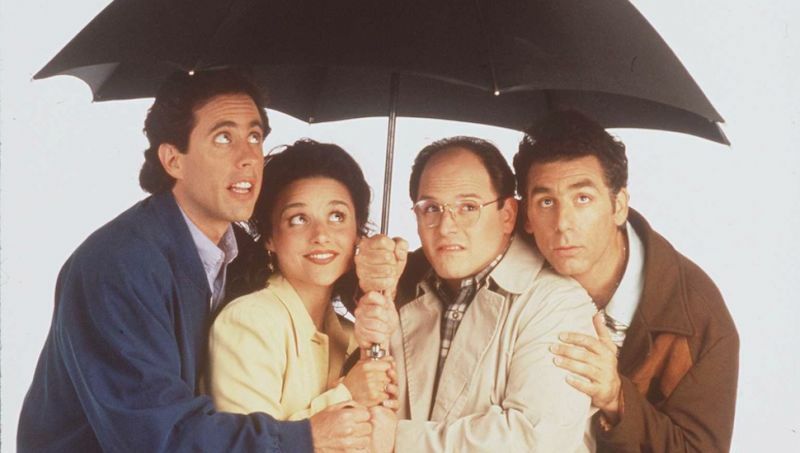 When asked if Jason was surprised to get the call, Seinfeld replied, "No, he remembered that he played that character for nine years, he was not surprised that he was asked to play George." It's possible this is all just hype for a Super Bowl commercial or an episode of Comedians in Cars — when asked, Seinfeld wouldn't confirm or deny details about his "secret project," first saying, "It's not," and later adding, "[But] it's not-not." Seinfeld's been talking about a lot of projects lately — a few weeks ago he teased a "big, huge, gigantic project" with Larry David that may or may not be a play. Either way, it isn't the first time the actors have revived their characters, nor is it the first time they've staged a reunion. They filmed a meta reunion on the seventh season of Curb Your Enthusiasm where Seinfeld, Alexander, Michael Richards and Julia Louis-Dreyfus played themselves playing their Seinfeld characters on a fictional reunion special.